Image captured near the touchdown site immediately after touchdown. Image credit: JAXA, University of Tokyo, Kochi University, Rikkyo University, Nagoya University, Chiba Institute of Technology, Meiji University, University of Aizu, AIST. After taking off again, Hayabusa2 acquired an image of the touchdown spot using its Optical Navigation Camera – Wide angle (ONC-W1). From this image – which was taken a minute after the spacecraft had reached an altitude of 25 km (15.5 mi) – the mission team saw that the landing spot was suddenly darker than its surroundings. At the moment, the reason for the darkening is unknown, though it is suspected that it may have been caused by the spacecraft’s thrusters kicking up grit as it took off again. This would seem like the most likely explanation, except for the fact that some of the particles that were kicked up should have been caught by the sample horn. Another possibility is that it was caused by one of the spacecraft’s “bullets” – 5 gram impactors designed to break up material on the surface so they can be collected more easily. Made of tantalum metal, these bullets are fired from the sampling horn at speeds of 300 m/s (670 mph), so it too could be what kicked up some darker material from the subsurface. What is clear at this point is that the patch of darker material was not there before the spacecraft landed. This was confirmed by comparing images taken by the ONC-W1 during its descent. As you can see from that image (posted above), the proposed touchdown site was indistinguishable from its surroundings, composed of the same combination of lighter-colored rocks and regolith. In keeping with the mission team’s goal of finding a location that was large and flat enough to collect samples from, it is also free of obstructions (like the larger rocks seen to the left of the landing area). The spacecraft began descending there after dropping a small, reflective “target marker” on the surface (indicated by the x) that was used to guide the spacecraft as it made its descent. Originally, JAXA had planned to carry out the landing operation and sample collection back in October of 2018. This was shortly after the spacecraft had deployed its MINERVA-II rovers to Ryugu, which began then hopping around and sending back data and images of the asteroid’s surface. However, pictures taken from orbit orbit showed that there were several large boulders in the proposed landing area that would get in the way. In addition, any rocks that were 50 cm (~20 inches) or more in height would obstruct the sampler horn – which extends to a distance of 1m (3.3 ft) from the bottom of the craft. 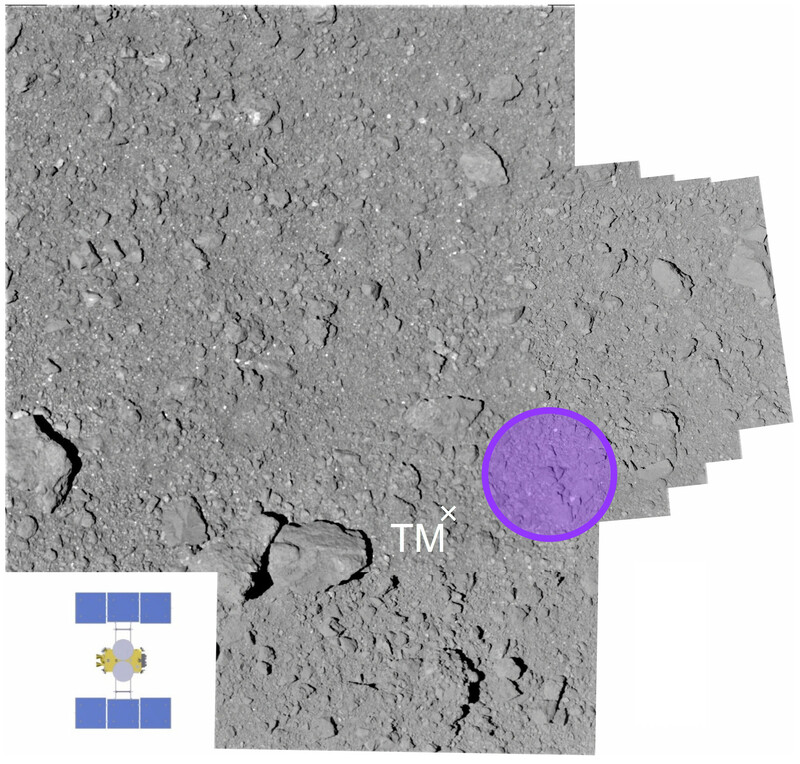 The mission controllers also hoped that they would be able to find a flat area about 100 m (328 ft) in diameter, but the rugged nature of Ryugu’s surface made this impossible. As a result, the team had to settle for the 6 meter (20 ft) stretch of surface they ultimately chose. And much to their surprise, the landing area changed color after they were done with it. You could say this is the latest unexpected thing that Ryugu has presented scientists with. But then again, encountering the unexpected is exciting when you’re studying objects that date back to some of the earliest periods of our Solar System. Hopefully, Ryugu will have a few more surprises in store before Hayabusa2 is finished with its sample collection and begins returning to Earth this combing December.